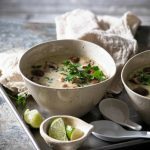 Coconut Chicken Soup – ‘Tom Kha Gai’, its Thai name – is one of the most flavorsome soups you’ll ever try. 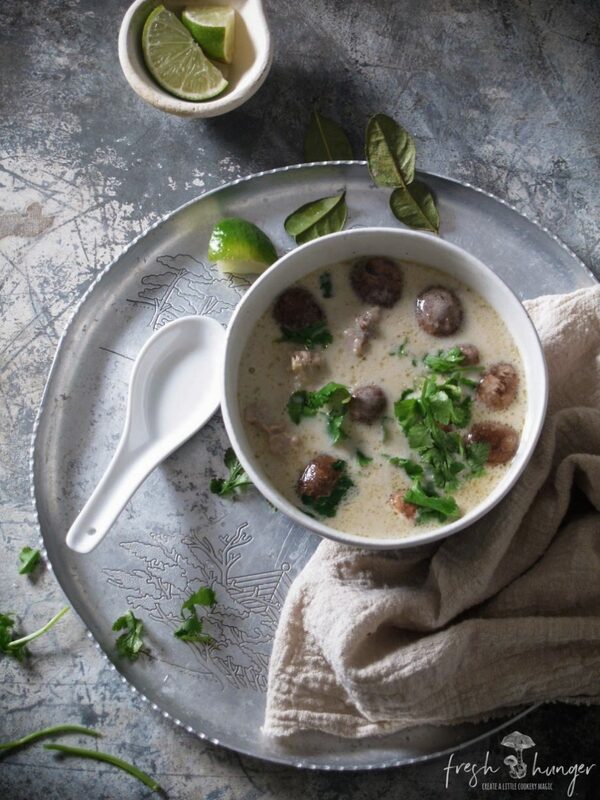 The perfect balance of kaffir lime leaves, piney galangal & pungent fish sauce together with silky coconut milk produce a vibrant & authentically flavored Thai soup. ‘Tom kha gai’ means – coconut galangal chicken & it’s the galangal, along with the kaffir lime leaves, that give the soup such depth of flavor. An easy soup to pull together, it boasts few ingredients for such a powerhouse of flavor. There is a tiny bit of cheating in the form of some ready-made Thai curry paste but that’s okay, cook smarter not harder. With spring finally upon us in the northern hemisphere there’s still a few cooler nights we have to endure. 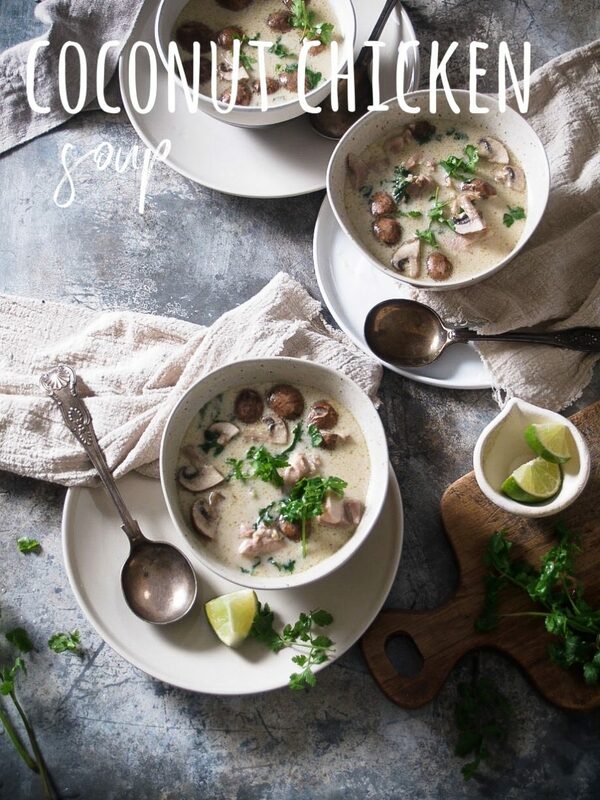 Curling up on the couch with a bowl of coconut chicken soup & firing up Netflix makes for a cosy night in. Forget the Thai-takeout when you can recreate authentic Thai food at home. A soup is the perfect place to start. For a list of Thai pantry, must-haves check out this article. Want to try your hand at some other Thai recipes? They’re easier than you think. Try Thai Fish Cakes & Pork Larb. 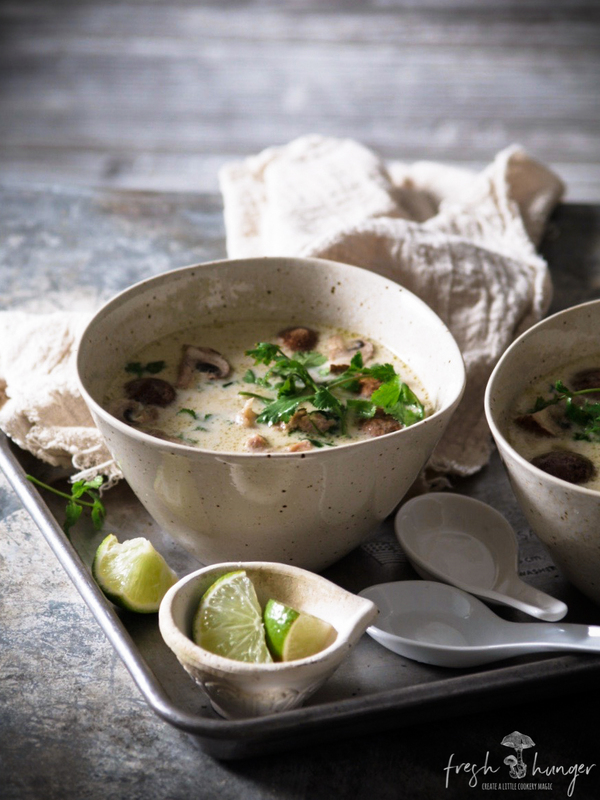 The perfect blend of Thai flavors, coconut chicken soup is creamy, exotic & loaded with flavor. It’s also very easy & quick to make. Combine the broth, coconut milk, curry paste, galangal, lemongrass, lime leaves, fish sauce & palm sugar in a pot or Dutch oven over medium-high heat. Bring to a boil then reduce heat to medium-low. Simmer, uncovered, for 10 minutes to infuse flavors. Add the chicken. Simmer, partially covered, for 10 minutes, stirring occasionally, or until the chicken is cooked. Add the remaining ingredients & cook for about 5 minutes or until mushrooms are softened. Remove lemongrass stalks, lime leaves & galangal before serving.